Home › News › Kitchen takeover for Charity! 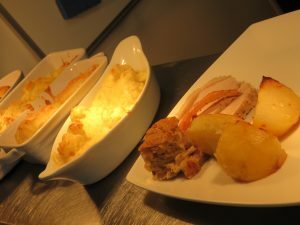 The Level 1 Introduction to Culinary Skills students were offered the chance to produce and cook a lunch menu in connection with Greenway Farm, Wembdon, raising funds for the charity Brainwave. Customers were delighted with a three course meal, including roast pork or salmon as the main meal and a yummy chocolate pudding. The students were able to transfer their skills from The Red Apron, a cafe serving College staff and students, to preparing, cooking and serving the public in this event. This was a very valuable opportunity for them to gain extra experience of working within the catering industry and to build on their confidence and self-esteem. The students rose to the challenge, really enjoying the experience and positive feedback was received from the customers. Thank you to Martin at Greenway Farm for this wonderful opportunity for the students. Everyone is looking forward to another joint venture and kitchen takeover! To find out more about this course and how to enroll at BTC, call 01278 441234 or click here.